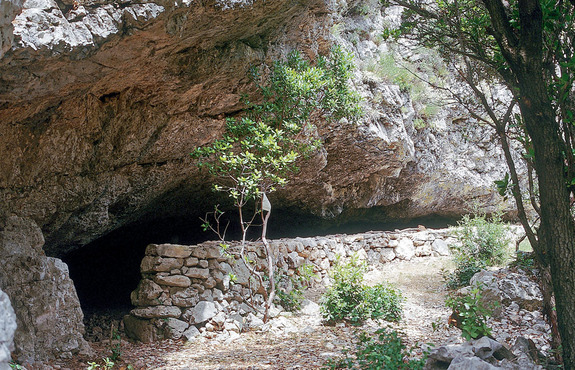 Nakovana Cave - Credit: Staso Forenbaher - The cave where the astrologer's board was found. The wall in front was built recently and is part of a sheepfold. A Hidden Chamber - Credit: Staso Forenbaher - When the team went through the tunnel they found themselves entering a chamber which nobody had visited in more than 2,000 years. A phallic shape stalagmite was discovered along with thousands of pieces of fine Hellenistic drinking vessels. Tiny pieces of ivory were also discovered that had to be carefully reconstructed, they turned out to be the remains of the oldest known astrologer's board. Drinking CupsCredit: Staso ForenbaherThousands of pieces of Hellenistic drinking cups were discovered. These partially reconstructed examples date from the 3rd and 2nd century BC. The date of these cups suggests that the cavern was in use for hundreds of years before being sealed sometime in the 1st century BC.